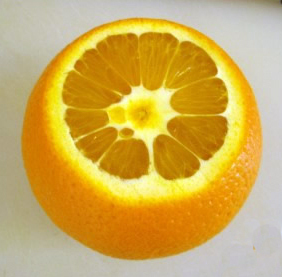 All you need is a very sharp paring and a cutting and you’ll be ready segment an orange or any other citrus fruit. First, cut off the very top and very bottom of the orange. Not too much, just enough to expose the fruit and give it stability. Next, cut away the orange skin and the white pith. Star at the top and slice downward, follow the curve of the fruit as best you can. If you missed it the first time, you can go back and trim up the orange. Now it’s time segment the orange. 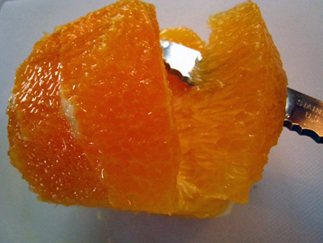 With your paring knife, slide the knife between one of the segments and the thin membrane. 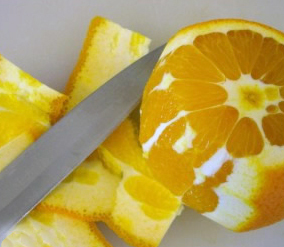 Cut until you get to the middle of the orange, but don’t cut through the membrane. Using a scooping motion, turn the knife back onto itself, hook under the bottom of the fruit and pry it away. Continue using the same motion with each segment. With a little practice, these segments will pop out. This entry was posted in Article, Fruit and tagged How to, orange by foodies4mmc. Bookmark the permalink.